With Brooklyn Prospect Park just around the corner, staying at this Brooklyn hotel is a real treat and treasure in a city where finding a competitively priced hotel can be a challenge. Enjoy easy access to transportation and a subway stop that's just steps from the hotel door, so that the best of New York City is only a short ride away. Whether it's Barclays Center or great shopping and dining, there are endless things to do in this borough. Brooklyn hotels are known for being close to it all, but this Best Western property raises the bar high by mixing in great customer service and affordable rates even during peak season. Start your morning with a free, full breakfast filled with favorites such as a hot waffle bar, fresh seasonal fruit, cereal bar and bottomless Arabica coffee. Skip the overpriced breakfast spots and indulge in a wide selection of breakfast goodies in the comfort of your Brooklyn hotel. A location close to major attractions makes every day a new adventure, whether guests prefer classic NYC attractions like the Statue of Liberty or just strolling around the Brooklyn Botanical Gardens or Museum. Business client friendly, the proximity to corporate locations makes this property a favorite for business travelers. Close to JFK, LaGuardia and Newark Airports, it's easy to get to this Brooklyn hotel for a meeting at Metrotech Office Complex or a visit to the Veterans Administration (VA) Hospital. The Brooklyn Navy Yard is nearby, too, and a number of New York Marathon runners and supporters prefer this property since it's a hotel right on the route. With a friendly and accommodating staff and a luxurious sauna, this eco-friendly certified hotel is a Silver Level GreenLeader property on TripAdvisor. Enjoy the best of this Brooklyn hotel, whether you're here for business or leisure. 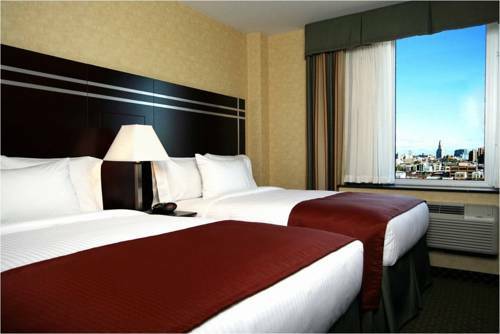 Book your next stay at Best Western Plus Prospect Park Hotel and enjoy all the city has to offer! Across the street from El Cozumel, full service, International, open for: lunch, Economy Peruvian restaurant. .30 mile(s) from Taqueria DF, full service, Mexican, open for: lunch, dinner, Traditional Mexican Food. 230 mile(s) from Washington D.C.
2.00 mile(s) from Atlantic Center Mall, one of Brooklyn's largest shopping hubs, with stores ranging from Bath & Body Works and The Children's Place to Target. The mall is located in Fort Greene. 4.00 mile(s) from New York University, founded in 1831, New York University is the largest private university in the United States. The university, which is composed of 14 schools, colleges, and divisions, occupies five major centers in Manhattan. 3.00 mile(s) from The Barclays Center, The 675,000-square-foot, state-of-the-art sports and entertainment venue will be home to the professional basketball team the Brooklyn Nets. 14.00 mile(s) from Arthur Ashe Stadium, easy access via Subway stations to USTA Billy Jean King National Tennis Center.